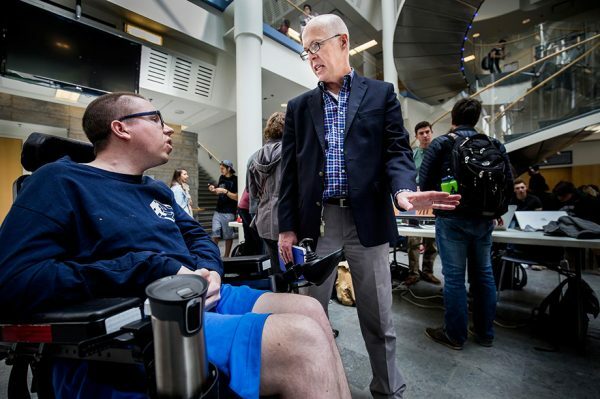 The U-M Council for Disability Concerns has named David Chesney, a lecturer in computer science and engineering, as the 2018 recipient of the James T. Neubacher Award. Reimagining the way in which U-M campus learning and living can be designed for those affected by a disability poses a number of challenges, but Chesney encourages his students to do just that. He teaches students at both the beginning of their undergraduate academic experience and at the end that the skills they develop can not only be used to solve excessively technical problems but they can also have a significant social impact. Established in 1990, the recognizes U-M faculty, staff, students. or alumni who demonstrate a commitment to making the campus welcoming and accessible to people of all abilities. It comes with a stipend provided by the Office of the President, and is presented annually in October during Investing in Ability Week.